After passing the state Senate overwhelmingly, California’s bipartisan attempt to reform asset forfeiture laws ran aground in the Assembly, victim of a powerful lobbying campaign conducted by law enforcement and its allies. Golden State cops teamed with prosecutors to sink the legislation once it became clear that the Senate vote had made it a viable threat to current forfeiture law, which permits law enforcement to keep confiscated property worth under $25,000 even if the former owner is not convicted of a crime. Through these so-called forfeitures, police departments across the country have been able to swell or cushion their budgets — sometimes substantially. But in spite of protections that have made California’s asset forfeiture rules more stringent than others, lawmakers in both parties zeroed in on the practice as excessive and sometimes unjustifiable. State Sen. Holly Mitchell, D-Los Angeles, and Assemblyman David Hadley, R-Torrance, advanced legislation that would have returned property valued at any amount without a conviction. But after the state Senate version, SB443, won in a 38-1 vote, bipartisan support for the bill began to dry up, despite efforts to scale it back in committee and dispel budgeting worries. “The bill was opposed by Republicans and some Democrats, and failed on a 24-41 vote in the Assembly. It could be revived on the floor in the future,” the Los Angeles Times noted, although this year, the deadline for passing new legislation itself has passed. Adding to the uphill climb, the federal government did its own part to pressure the state to abandon reform. 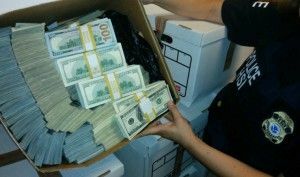 “Documents obtained by the Institute for Justice show that the California District Attorneys Association has been circulating emails from the Justice and Treasury Departments confirming that the current reforms proposed to California’s civil asset forfeiture laws would make the state ineligible to receive millions of dollars through the federal government’s Equitable Sharing Program,” according to the Daily Signal, a news site run by The Heritage Foundation. Through that program, which gives a cut of seizures to agencies at the state and local level, California law enforcement netted nearly $90 million last year, the Daily Signal noted. So far, advocates for California forfeiture reform have not talked up the prospect of reintroducing a bill for next year’s legislative session. According to Reason, however, another option remained — a ballot initiative building on past successes with reducing some criminal penalties, paring down the so-called “three strikes” law, and encouraging treatment instead of jail time for lesser drug offenses. “But that’s a plan that would have some timing issues,” Reason noted, with organizers unlikely to get a measure before voters until the off-year election in 2018. Nevertheless, “if the polling is accurate, it’s certainly an option if they aren’t able to push legislation through by then.” According to Americans for Tax Reform, California respondents expressed hostility to asset forfeitures “by a massive 76 percent to 14 percent.” Despite the reform bill’s setback in Sacramento, little seemed likely to shift that imbalance in the months and years to come.